I am not an expert when it comes to making rotis or parathas but I guess I do a fairly good job of it! Hence, writing a recipe on paratha seems a bit daunting. Please bear with me :D Mooli or Radish is a very nutritious vegetable so including this in your diet frequently is definitely a good idea (if you can survive its strong stench that is!). A good way of doing that is to make stuffed mooli parathas. Once cooked it tastes pretty good and it would be hard to believe that it actually is the same stinking vegetable. Radish is good for the liver and is an excellent detoxifier. Radish is very rich in roughage. Radishes are diuretic and hence, beneficial against urinary and kidney disorders. Vitamin-C, phosphorus and zinc and some members of vitamin-B complex, which are present in radish, are good for skin. Relieves congestion of the respiratory system. And lots more!! You can read the article on Organic Facts for more information. Stuffed parathas are usually thicker than normal rotis but I like it as thin as possible. 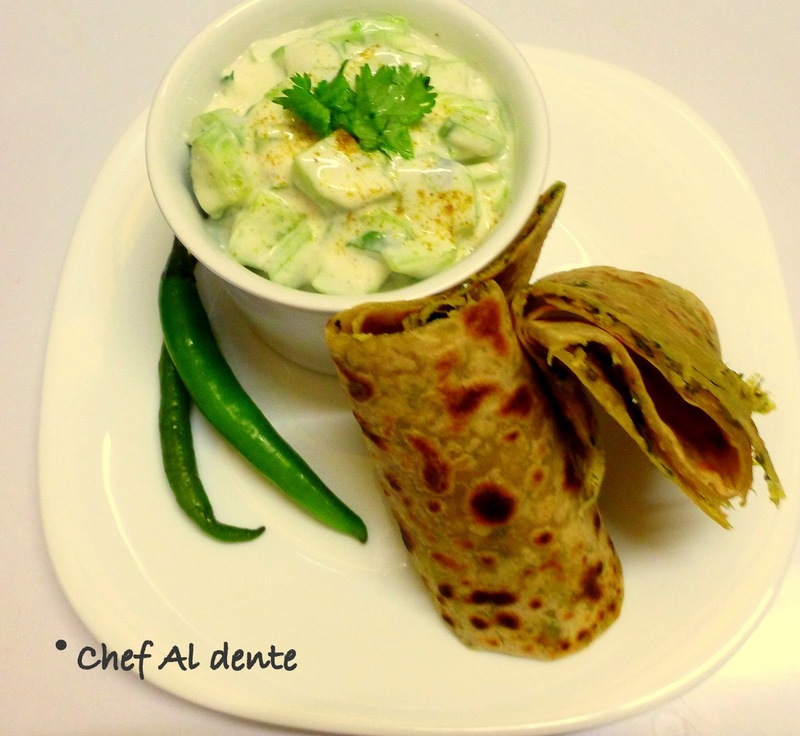 There are many sites which elaborate step-by step process for making rotis or parathas with excellent photos. I am just outlining how I made my stuffed parathas. May be a bit vague to people who have never made rotis or parathas before - je suis désolé! Prepare the roti dough first by mixing and kneading all the above ingredients. Rub some oil on the surface of the dough and leave it to rest, covered. To the grated radish, add a pinch of salt and turmeric and set aside for 10 - 15 mins. Then squeeze the radish and remove all the water that comes out. Heat oil in a kadai and add the cumin. When they sizzle add the squeezed out grated radish along with the spices and the green chilli. Saute well till it is properly cooked. Garnish with the chopped coriander leaves. Heat a tawa on medium flame while you roll out the rotis. It should be very hot. Take a small lemon sized ball of the roti dough and roll it into a small circle. Take a small tennis ball sized amount of the radish stuffing and place it in the centre of this circle. Grab all the ends of the roti circle and pinch them together at the centre to make a small 'potli' / pouch. 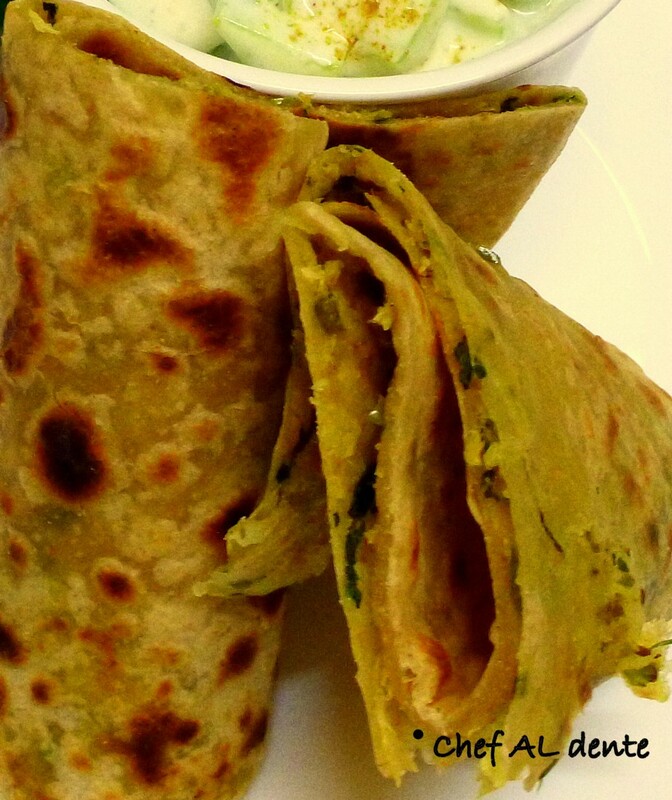 Flatten it slightly, dust some whole wheat flour and roll it out into flat parathas. Take care to be gentle while rolling so that the stuffing does not come out. Cook the rotis on the hot tawa. When you see small bubbles appearing on one side flip it and then cook the other side. Both sides should have light brown spots. 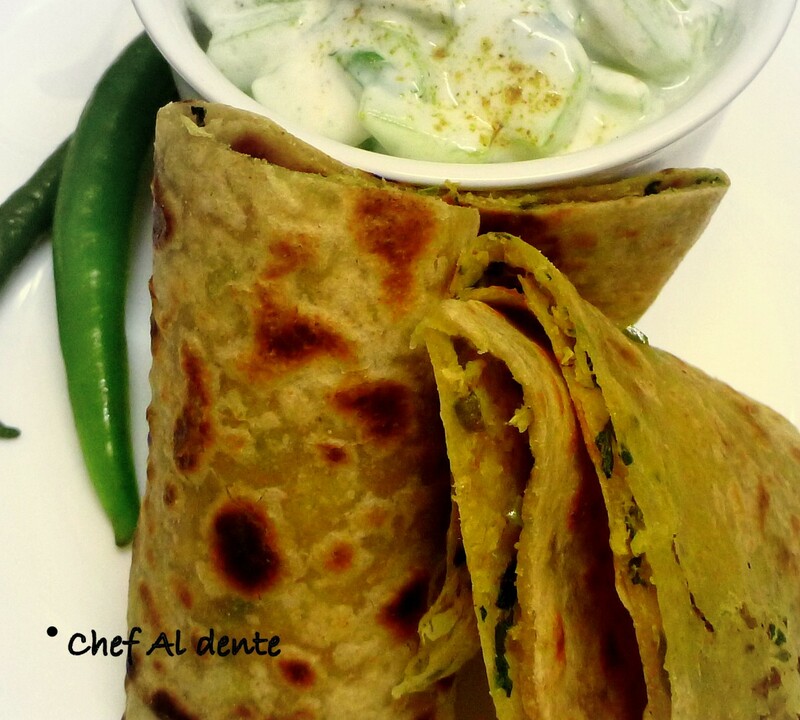 Smear some ghee on both sides and serve hot with pickle and raita.